Dolphin was built, and probably designed by the Ewens brothers of Whangarei, Frank, Ernie and John, for themselves in 1902. The brothers and their father were builders in the Whangarei district who had a passion for sailing. Dolphin took part in the Whangarei Regattas of the time. She was sailed to Auckland in late 1907 and was sold here in early 1908. Soon after, the Ewens started building the first 6 metre yacht in New Zealand, Scout. In January 1908 Dolphin was renamed Ena. She was moored at St. Georges Bay and raced with the North Shore Yacht Club. In 1919 she reverted to Dolphin and in 1922 was given the sail number E15 in the list of 4th Class yachts. A friend of the Ewens brothers, Chuck Taylor, bought her in 1927 and was her long-term owner until 1943. 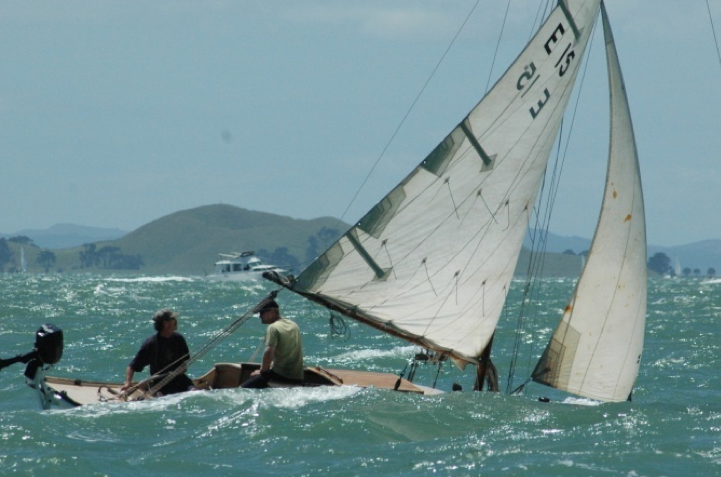 Over the years after that she drifted out of racing and went downhill until artist and educator Peter Smith bought her in Tauranga in 1972 and sailed her back to Auckland. Peter and his family carried out a loving restoration over a year at the end of which she emerged, transformed, as Rebecca. Peter Smith’s beautifully written and illustrated book, Rebecca, the restoration of an old yacht, was a key factor in driving enthusiasm in hundreds of Kiwis for the rescue and preservation of old pleasure craft. As Rebecca the yacht took part in many of the early vintage revival yachting events on the Waitemata and gained an even higher profile when she was sold to Peter Mulgrew, Sir Edmund Hillary’s close friend. Peter was killed in the Erebus crash in 1979. Since then the yacht has reverted to her original name, Dolphin, and was owned by Colin Davidson, a well-known skilled traditional boat builder and Alex Atkinson who kept her in beautiful order, fit for another century or so. Dolphin was purchased in March 2008 by the Tino Rawa Trust.